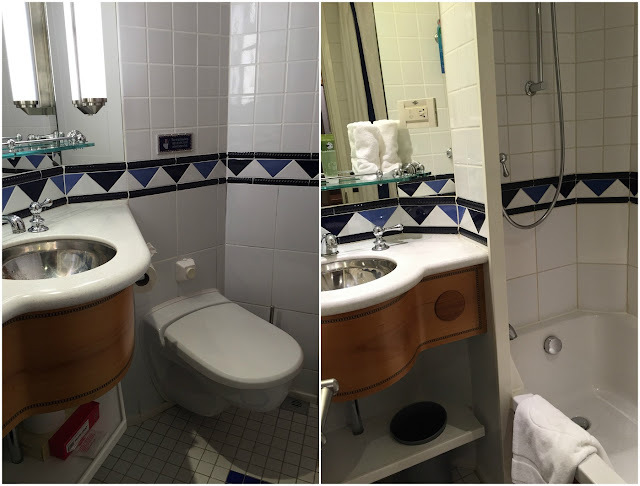 On our recent cruise aboard the Disney Magic we stayed in Stateroom 1048, a Deluxe Oceanview Stateroom, and I thought I'd write a little review of our stateroom in case it is helpful to anyone researching a cruise aboard the Disney Magic. I would imagine that all the staterooms in this class will be very similar. Stateroom 1048 sleeps four people, and is located on Deck 1. It's very close to the Midship elevators and also close to the Forward elevators. It's in an excellent location for the front gangway when you are in port (the one which was used on three of our four stops) meaning you don't need to worry about waiting for elevators when you are leaving and entering the ship. It's also only a few floors below the Walt Disney Theatre, so if you are coming back to the room after a show you can avoid the crowds waiting for the elevator by using the stairs straight back to the room. To get to the other end of the ship from Deck 1 rooms you do need to go up to a higher deck and walk across, but this only affected us when we wanted to get to Cabanas directly from our room, as on all the other decks you can walk the entire length of the ship. We found that the location of the room meant it was very quiet. There is no noise from any of the ship's entertainment and only a very little corridor noise from people returning to their rooms. The motion from the sea in the room was much less than that in other areas of the ship. The room has two small portholes instead of one large window, but this wasn't a problem for us as I just enjoy having a window, and it meant that the children could look out of one window each! I believe that rooms in the same class on higher decks have the one larger porthole. The stateroom has a fridge which is always handy to have, and plenty of storage space with lots of drawers and cupboards. The bed is raised high which means that you can easily stash suitcases, strollers and so on underneath, and there was also plenty of hanging space in the wardrobe. There is also a safe and hair dryer. There are two small bathrooms which is really useful in a family room. One has a toilet and sink, the other has a sink and a bath. Although the bath tub isn't a full length bath, you can fill it deep and it was large enough for two children at once! The bed is big, comfortable and fills up most of the width of the room, but the back half of the room is very spacious even when the bunk beds are set up. There is a thick curtain to pull across the room, and it means that you can put children to bed earlier and not worry about disturbing them if you want to sit and read or use the bathroom. The television is on their side of the curtain, but you can swing it over to your side of room if you want to watch it while they are sleeping. While you are eating your evening meal the stateroom attendant will set up the bunk beds and they will be put away for the day at some point in the morning. You aren't able to set them up yourself, but there will always be someone around to put them out for you if children want to nap during the day. The top bunk felt safe for children and there is a light near the ceiling. 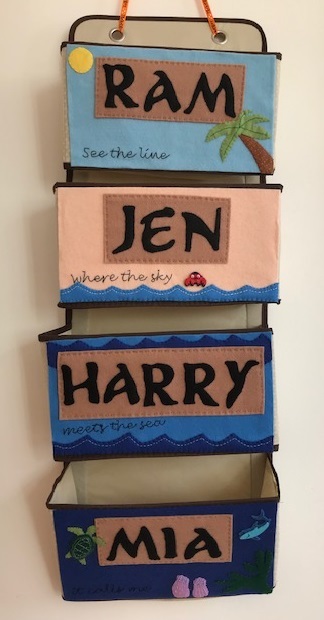 The room is filled with plenty of little Disney touches! It was clean, well maintained, and suited us perfectly. 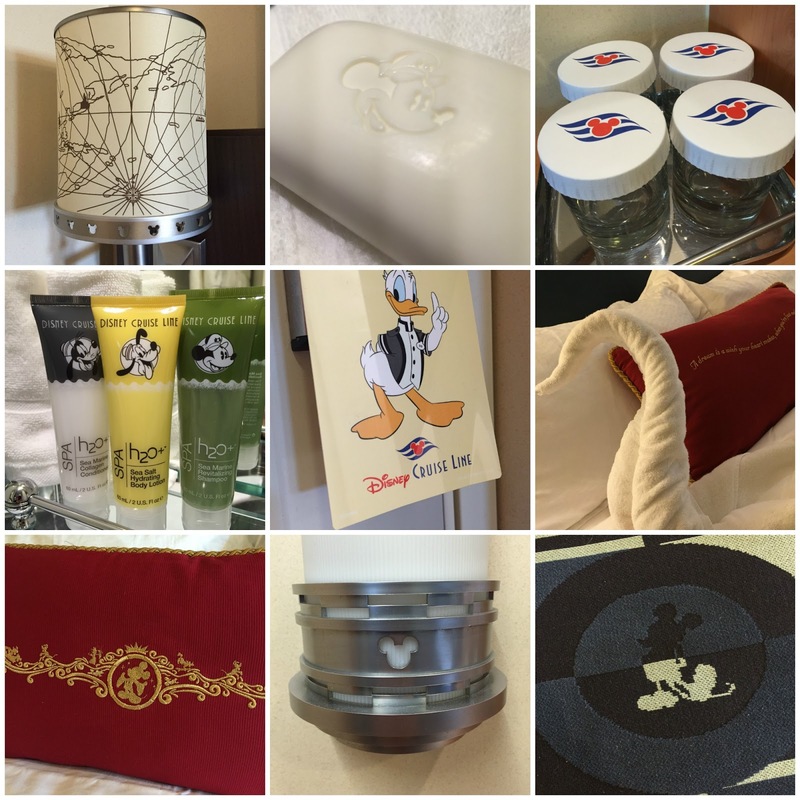 If you have any questions about the stateroom or about a Disney cruise in general please do leave a comment, I'd be happy to help! The TV is normally on an arm that you can swing out past the line of the curtains if you so desire. I have checked with my husband and you are quite right, the TV can be moved over onto the other side of the curtain. Thank you very much for commenting, I've updated the post! Did you experience some noise in the storeroom? Some people say that there is a lot of noise in the stateroom on the first floor?! No, we didn't have any problems with noise at all!